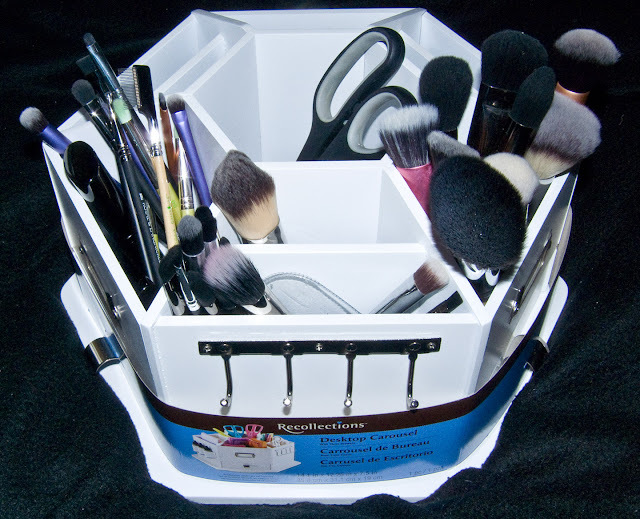 Retails for 55.99CAN but got it 40% off as part of the annual storage solution sales going on right now at Michaels. I also got an extra 20% as well on it with a coupon. So it came to $30.37CAN when everything was said and done with tax. 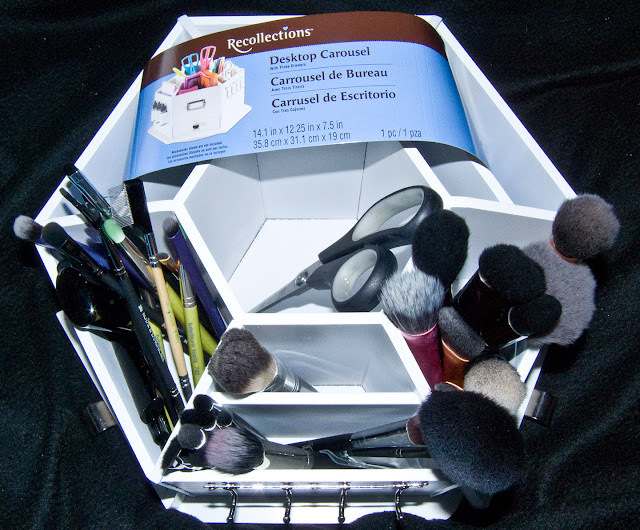 This hexagonal box it made of wood and painted with enamel white paint. it heavy for that reason as has a tone of ball baring in the bottom for sipping. 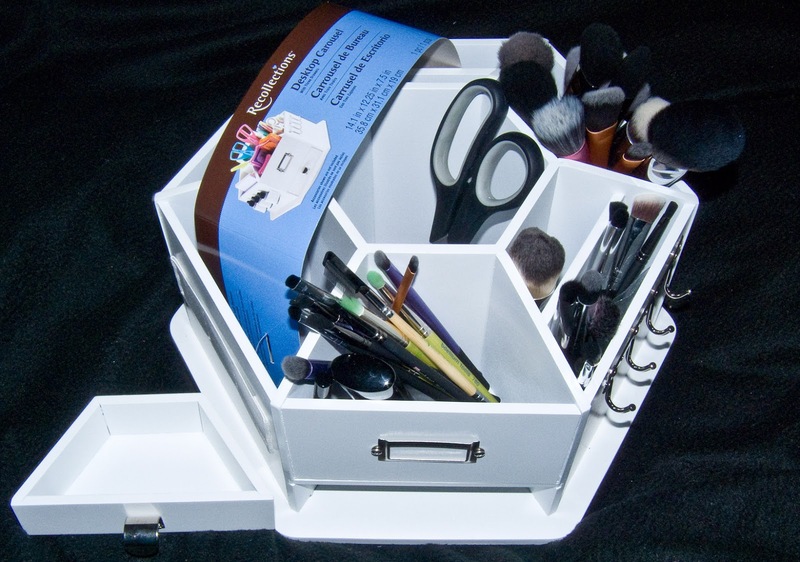 On the sides it comes with 3 magnetic drawer with a tiny label plate, 1 side for a photo/large label, 1 elastic loop panel with 4 slots, and 1 panel with 4 hooks on it. Recollections Desktop Carousel has 3 small magnetic drawers. 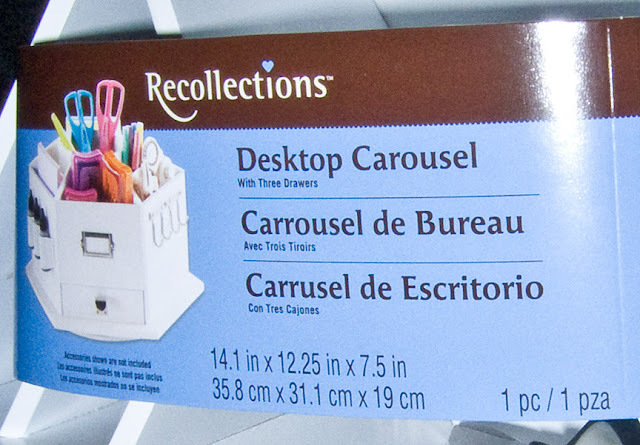 Recollections Desktop Carousel VERY Deep! Large pair of fabric cutting scissors in the centre. Label: dimensions 14.1" wide X 12.25" x 7.5"
To make this a bit more easier to get at the brush I fill the outside well with acrylic beads for vases it got at Dollarama for $2 each. I filled it with 5 so far but need another bag and a half to fill out the back well and the one on back left. Because they beads are plastic you can wash them in a fine mesh sifter to clean them. I should really try to weed out some more brush as I has intended to use to use 2 of the well for eye pencils (maybe the centre and the back one then instead). 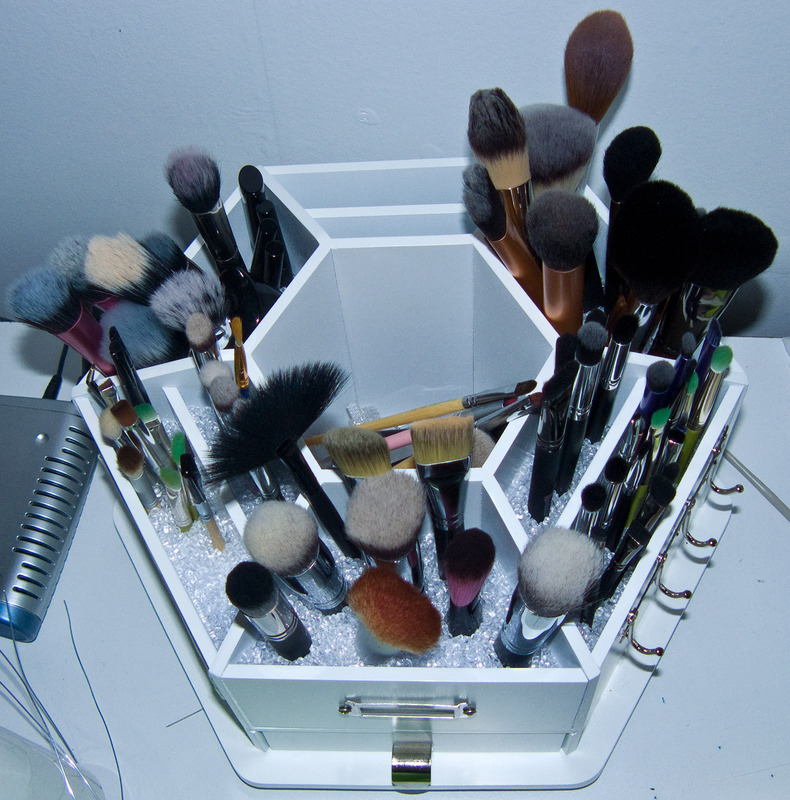 For reference I have 98 brushes in this thing, with some dirty one n the centre that need cleaning. Verdict: I'm loving it! I use to own a plastic turn-about/carousel/turntable as a kid but it was super flimsy, which is why I like the weight/structure of this one. The Pampered Chef also make two called the Tool Turn-About, one in black (you probably seen on youtube) and a bamboo that caught my eye. The bamboo one measures at 8" x 5" the original black one docent list the size on it but it larger then the bamboo one but from other peoples photos I think it's smaller then Recollections Desktop Carousel for reference.